There once was a time when the old and the new had something in common: They could both be special. When the Great Wall of China was new, it was special, one-of-a-kind; now that it is ancient, it is still—and perhaps even more—special. Jobs and technology used to be like that too: Once upon a time, when gunsmiths first appeared, they and their molds and lathes were special, in the cultural as well as professional sense, because the occupation was new and its adepts were few. As for their actual historical supply-and-demand crafts balance and ratios, that’s a matter for economic historians to explore. Nonetheless, the history of guns suggests that for the early and later individual gunsmiths’ indefinite futures, their job prospects were excellent, as demand for guns burgeoned in drumbeat quick-march step with endless wars, frontier resettlement and territorial conquest, until large-scale arms dealers and munitions manufacturers took over. At the same time, and allowing that this is speculation, the few remaining arrowsmiths in the job market were probably, for a time, able to confidently look ahead to continued employment as their numbers shrank in proportion to the shrinking demand for their skills. The arrowsmiths probably became culturally “special”, in the sense of being both rare and quaint, like horse-drawn carts still seen in some modern Chinese towns, like the one shown here, as their numbers dwindled. However, both the new gunsmiths and the old arrowsmiths were likely to have been eminently employable, because the former were increasing in numbers along with increasing demand for muskets and blunderbusses, while the latter were presumably decreasing in employable numbers in tandem with decreasing demand for quivers, arrows and bows. In the professional and cultural sense, both occupations were, at the same time, probably special, unlike many modern occupations, e.g., which, in virtue of over-supply are professionally anything but special, and, as cultural icons, in virtue of their absolute numbers, trivial. For example, as early as 1997, the U.S. Government Accounting Office filed a report summary (excerpted below), about the oversupply of graduates in vocational training programs. It can only be imagined that since then this glut has been exacerbated in some of these occupations and others, as many of the unemployed seek retraining for and shelter in a cratered U.S. job market, if they can still afford or borrow for it. In the 1960’s, computer programmers were, as the gunsmiths once were professionally and culturally, similarly new and few, at least in absolute numbers. Their initial scarcity in the context of rapidly growing market demand meant that their being new and few, like the early blacksmiths, was a sign of good, even great career prospects for them and for life. At the same time, slide-rule designers had to find new careers (or cater to a niche nostalgia market, such as the one www.thinkgeek.com caters to with its specialty slide rule). Importantly, neither the programmers nor the gunsmiths initially numerically grew or shrank so rapidly as to make their existence culturally or professional trivial or their employment problematic. Fast forward to the present. Things have changed and new is no longer a guarantee of much—either professionally or culturally, or, if it is, not for very long. That’s because of a dramatic historical transformation in the dynamics and time frames of newness, which are shrinking dramatically—both in terms of frequency of debuts and speed of obsolescence. As technological innovation, market penetration, information diffusion, post-secondary graduation growth and lifestyle homogenization have accelerated, today’s new is tomorrow’s old and commonplace, almost before tomorrow arrives. That’s what “New New” means. Like me, you are highly unlikely to be old enough to remember the times when having a new car, such as a Stutz Bearcat or Pierce Arrow, was a new concept and a rare luxury; but you are far more likely to recall when a cell phone was. The older among you may also recall how fresh and exotic the idea of “going to college” once was and how girls would gasp, “You’re a college man? Wow!” Now, those gasps are yawns. These trends may be obvious and well-known, but less obvious are some of the implications for job hunters and recruiters who may not have connected the dots of rapid cultural diffusion, burgeoning occupational labor cohorts, college grade inflation, the vastly expanded supply of degrees and homogenization within socio-economic strata with changing career prospects. The fresh-faced fresh graduate scouring job postings that are well-scoured by hundreds or even thousands of other fresh faces may not be reading the new handwriting on the new job wall, instead imagining that a freshly-minted B.A. in 2011 will have the clout and the legs of one in 1950 or even 1990. The relationship between new human resources entering the job market and new opportunities is highly unlikely to be as linear as it once was (especially in light of labor productivity gains resulting from greater recession-induced business efficiency, automation, use of robots, etc.). Likewise they cannot expect to have a leg up for any time, save for only briefly—just as having a new college degree or the newest model iPhone is virtually certain to fail to distinguish anyone except fleetingly, if at all, especially given cultural dilution effects of and grade inflation/standards-lowering effects on associate and bachelor-degree graduation. This is the reality of the “New New”—the new form and fate that awaits almost everything new, from cameras to credentials, as rapid obsolescence (planned or otherwise); virtually instantaneous diffusion through advertising, availability and affordability; over-supply through over-reaction of planners and producers, e.g., B.A.-granting colleges; economic and cultural egalitarian-equalitarianism; the modern sense of entitlement to whatever is new and soon thereafter standard; training program hype vs. job reality gaps; and culturally, if not professionally, trivializing increases in both supply and demand make whatever is “new” nothing special for very long. The shelf life of the New New may be so short that many job seekers may find themselves on the shelf waiting to be picked, and waiting for a very long time. During my recent stay in China, I was asked during a charming walkabout in picturesque must-see Chengde with a Chinese former colleague why I was taking so many photos of old buildings, old districts, old technologies and other old, traditional cultural icons, such as fruit wagons and stalls. In framing my reply, I had my “New New” epiphany: I said that scarcity is one classic measure of value, and that the remnants of the rapidly vanishing traditional, older Chinese culture have greater scarcity value than the newest icons, such as BMWs, iPhones and bullet trains, irrespective of the cost and gee-whiz impact of these. This is not only because the latter high-tech things already vastly outnumber the remains of the past, but also because the vestiges of traditional Chinese society are being obliterated at a startling rate—hence an absolute as well as relative increase in scarcity for these surviving traces and relics. If I don’t photograph the old now, the chance to do so may soon be lost forever. Photograph a sleek new Chinese taxi? No rush and no need, except to document for the skeptics back home the dramatic changes in China. That’s when I formulated the concept of “New New” and compared it with “Oldest New”, e.g., the Pyramids of Egypt, the Great Wall of China, and even the humble arrow—all of which, when gleamingly new, were scarce, unique, special and culturally new much longer than the modern virtually immediately obsolescent new car, soaring high-rise office building, cell phone or computer science degree. 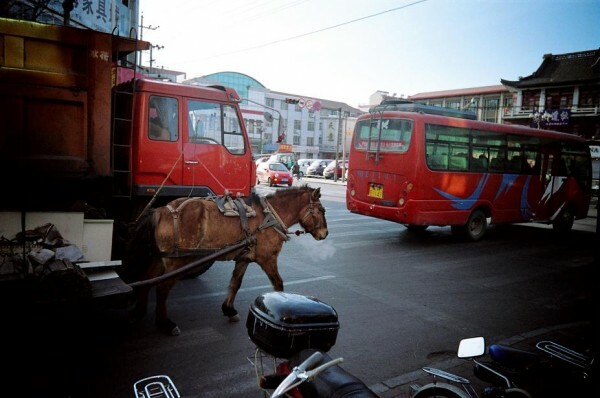 Easily bored with the commonplace, I have a special fondness for the “Oldest New”, and the simply “Old New”, such as the horse-drawn wagon I photographed in the streets of Pingquan, Hebei Province, in 2007, with “Older New” a distant third, e.g., my 2003 Yamaha Clavinova 209. In contrast, the modern “New New”, as a new concept, denotes that which is doomed to very rapid cultural and professional trivialization, obsolescence and early oblivion, perhaps to be resurrected as the older new, but only decades from now. Although the Chinese inspiration for the concept may have been different from mine, the outcome for the New-New People was precisely what my “New New” concept predicts: rapid obsolescence and trivialization—but only culturally, rather than professionally, since there were only few and minor employment niches, e.g., fashion boutiques and discos, in which the New-New People could gain a foothold. The situation recruiters closer to home face is different: Chinese-style New-New People’s self-disqualification is not the issue; the challenge in the West is a paradoxical disqualification through a kind of over-qualification, namely, an over-supply—too many people with similar, albeit good qualifications vulnerable to rapid obsolescence chasing too few jobs, many unaware of how commonplace and fleeting their best qualifications are, imagining instead that their newly-minted university degree or technical certificate has the impact and long-term, enduring distinctiveness a degree or certificate had before they were born. They face a double-whammy caused by mass-production and over-production of their qualifications, relative to the job market they face. On the one hand, their mass-produced credentials make their skills culturally commonplace, even trivial; on the other, the over-production and over-supply of many of those skills, e.g., teaching diplomas and degrees, make them professionally vulnerable—especially in areas characterized by rapid obsolescence and cutbacks. As a result, as awareness of this problem dawns on them and its impact makes itself felt, both their confidence and their employment prospects may erode. To help as many of them as you can by uniquely matching whatever is unique and useful in their skill and experience mix with a job that can make use of it. To be honest with them when obsolescence of their skills and other credentials is a reason they are not selected for a job, and to advise them about how to address this shortfall. To remain informed about macro and micro job gaps and gluts, e.g., your client or company’s departmental supply-demand imbalances that work for or against job applicants who may have multiple skills, with one skill set that can be more readily accommodated by you and the company/companies you are recruiting for than the alternative set. Encourage applicants to have a realistic perspective about how “special” they are or aren’t—at least professionally, if not also culturally, since delusions about either can impinge on their work expectations and performance, in the form of unjustifiable arrogance or needless self-effacement and obsequiousness. If you can do this for them, they may very well want to take your photo—as a treasured keepsake, even though, unlike the Chinese workhorse, you are likely to be on the job for a very long time to come.